Keith Miller’s Welcome to Pine Hill is a quiet visual exploration of race, class and daily experience conveyed with an intensity born from lead actor Shannon Harper and writer/director Miller’s full understanding of the film medium’s true potential. Welcome To Pine Hill, the film, does indeed start on the stoop, as it did in real life for Brooklyn neighbors Shannon Harper and writer/director/teacher Keith Miller. Keith was out walking his dog one night and local resident Shannon saw the two and recognized his old dog. Shannon confronts Keith and says that he wants his dog back, a stand off that though rarely acted out in current gentrified Brooklyn, plays out in the minds of both sides countless times each day. If not through a dog, through real estate and beyond… “that was our rundown neighborhood bar that you white out-of-towners turned into your cute faux old neighborhood cafe,” “that was where we all double parked before you took the space for your bike lane,” etc. 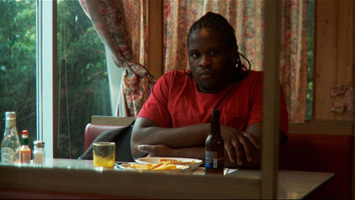 In the film, this encounter is perfectly played out by Shannon and Keith, and though Keith doesn’t appear again in the film, the story that unspools is informed by the race and class perspective of that inciting incident. Harper plays an amalgam of his actual self and a fictive created role. His character has left behind a life of ‘hood thugging and now works in midtown as a claims adjuster. In many of my Uncle Fred’s so called “real” movies, the film ends with the hero walking away from the crime life deciding to go straight, oftentimes with a woman by his side. I often wondered what it would be like for Bruce Lee living a straight life. If he was insulted one two many times at the water cooler by his branch manager would he slay him with a quick chop to the solar plexus? We watch Shannon go through his daily life in the office, but when a thug from his past life shows up and asks for a favor, I was ready for a creaky plot contrivance to rise up and draw him back to the streets. But instead the film stays true and real; something else happens to our hero, something that can happen to all of us, and now he has to deal with it just as we mere mortals would. In the process of dealing with this universal problem, Shannon and the audience rediscover the value of the tiny “insignificant” moments that make up our day. In Miller’s hands, these small moments become weighted with a rarely felt power and intensity as they become significant story points in a way that we would never experience in a typical movie. One of the aspects of real—my real, not Uncle Fred’s—film that I most appreciate is its ability to compress and expand narrative time as well as its unique ability through acting to meld both amateur and professional techniques to create an experience that is both a familiar yet transformative representation of our own lives. When the theater darkens and a movie begins, our typical time markers should be erased and we should be immersed into an experience of time, character and space, which then becomes its own narrative. Welcome To Pine Hill does have plot points, which I haven’t given away here, but they alone are not the explanation for why this film is so transporting. It’s the filmmaker’s ability to master the passage of narrative and screen time in such a way that we are reminded that there is only one real story that we are all part of: the countdown of our own biological clocks. I believe that if I can drag Uncle Fred off the stoop to see this film, he may finally understand that Welcome To Pine Hill is as “real” of a film as you can ever get.